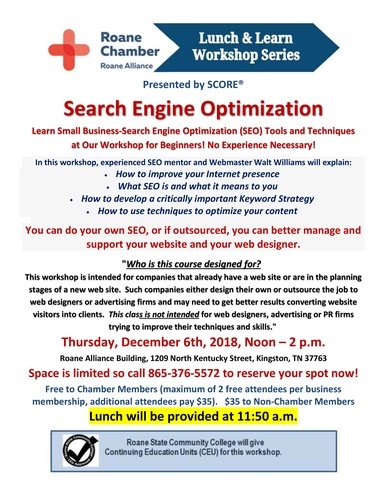 Roane Chamber Lunch and Learn Workshop Series - Search Engine Optimization. Name: Roane Chamber Lunch and Learn Workshop Series - Search Engine Optimization. Learn Small Business-Search Engine Optimization (SEO) Tools and Techniques at Our Workshop for Beginners! No Experience Necessary! You can do your own SEO, or if outsourced, you can better manage and support your website and your web designer. "Who is this course designed for? This workshop is intended for companies that already have a web site or are in the planning stages of a new web site. Such companies either design their own or outsource the job to web designers or advertising firms and may need to get better results converting website visitors into clients. This class is not intended for web designers, advertising or PR firms trying to improve their techniques and skills." Lunch will be provided at 11:50 a.m.
Free to Chamber Members (maximum of 2 free attendees per business membership, additional attendees pay $35).